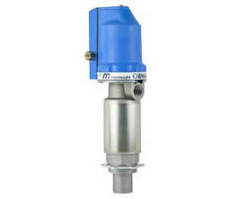 OILMASTER 1:1 ratio air-operated oil stub pump for wall mounting. Free flow up to 23 L/min. Supplied as bare pump. 1" BSP (F) inlet. Suitable for oils up to SAE140 viscosity & coolants. OILMASTER 1:1 ratio air-operated oil drum pump suits 205ltr drum. Free flow up to 23L/min. Supplied as bare pump. 1" BSP (F) inlet. OILMASTER® 3:1 ratio air-operated oil stub pump wall mounting. Free flow up to 13 L/min. Supplied as bare pump. 1" BSP (F) inlet. Suitable for oils up to SAE 140 viscosity and coolants. Zinc version of the T312S. OILMASTER® 3:1 ratio air-operated oil drum pump suits 205ltr drum. Free flow up to 13 L/min. Oilmaster® 5:1 ratio air-operated oil stub pump for wall mounting. Free flow up to 11 L/min. OILMASTER® 5:1 ratio air-operated oil drum pump.